This is a bit of a curiosity. Clearly from the inscription above the doorway the castellated gothic turret in which it is housed dates from 1864 although I assume that use of the spring would predate this considerably. Although it is regularly identified as the Boston Sulphur Well. it has also been referred to in some accounts as Ffynnon Parc Mawr, this name appears in Enwau Lleoedd Mon – this I believe is an error.. From correspondence I have had this name appears to be unknown locally. It is better known locally as Ffynnon Goch – the red spring – from the colour of its water. The well can be found beside a public footpath from a lane just off the A5025 about a mile from Llanallgo, Anglesey. 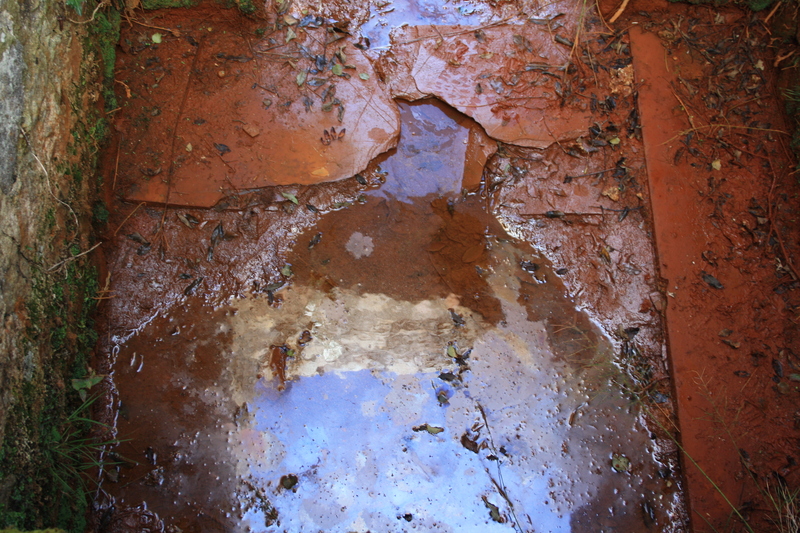 It appears on most maps as a chalybeate well, and from the reddish brown colour of the water in the well and of the mud in the door way it undoubtedly is. Its present muddy condition is apparently relatively recent; up until at least the 1940s it was regularly maintained and kept clean. The water then was clear and drinkable as it emerged from the spring although it would however take on a characteristic reddish colour when boiled.It is said that it was stronger in taste though with a less strong smell than the well known spa waters at Trefriw near Conwy.The Spring water certainly contained iron, and from the smell when it was clean probably sulphur too. 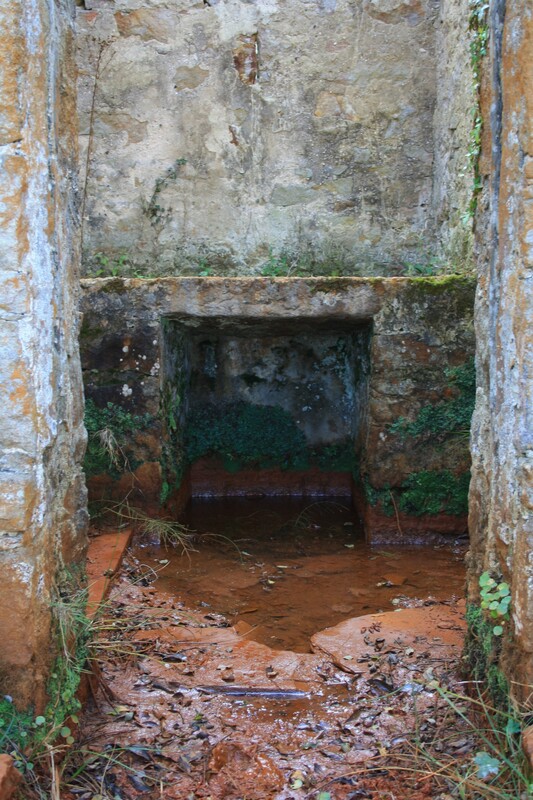 Chalybeate springs, high in minerals, particularly iron became very popular in the seventeenth century, and this continued through into the twentieth century. 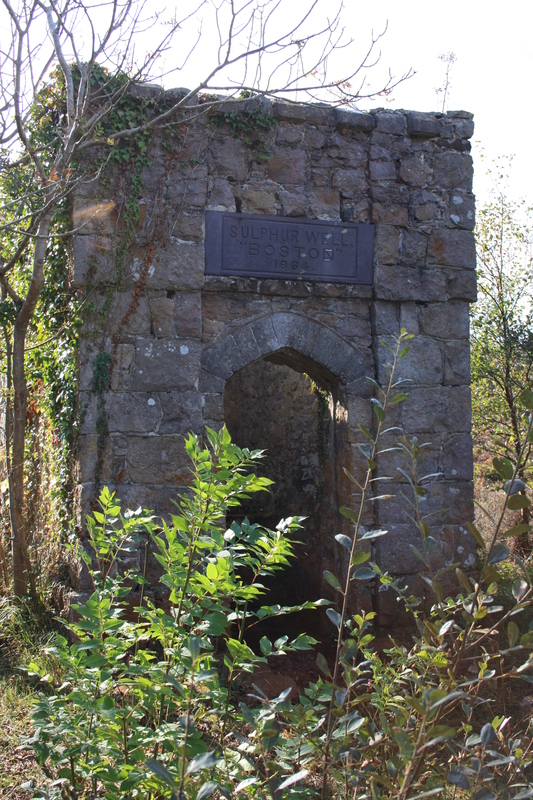 There were a number of noted chalybeate springs across North Wales that were held in high esteem in the nineteenth century and it might appear that the owner of the land this spring lay on, Lord Boston, took an interest in his own spring. Although the main seat of the Lords Boston is in Lincolnshire they own land here and have an estate at Llanidan on Anglesey. The Penrhoslligwy estate came into the family in the 1740s and remained a part of the estate until it was sold off following the death of the 6th Baron in 1945. It would have been the 4th Baron, who died in 1869 commemorated by a plaque in Penrhoslligwy church, who would have been responsible for enclosing the spring. The small castellated building with a north facing gothic arched door was given grade 2 listed status in 2002. It was probably originally roofed, with rendered internal walls and would have been protected by a door, of which no trace remains. The internal area is probably around eight feet by four feet, the spring rises at the end away from the door in a square pool underneath a stone topped, brick sided bench. on which to place your clothes and belongings whilst bathing perhaps.The spring then forms a pool occupying about two thirds of the area of the building, it would appear at one time to have been paved around. 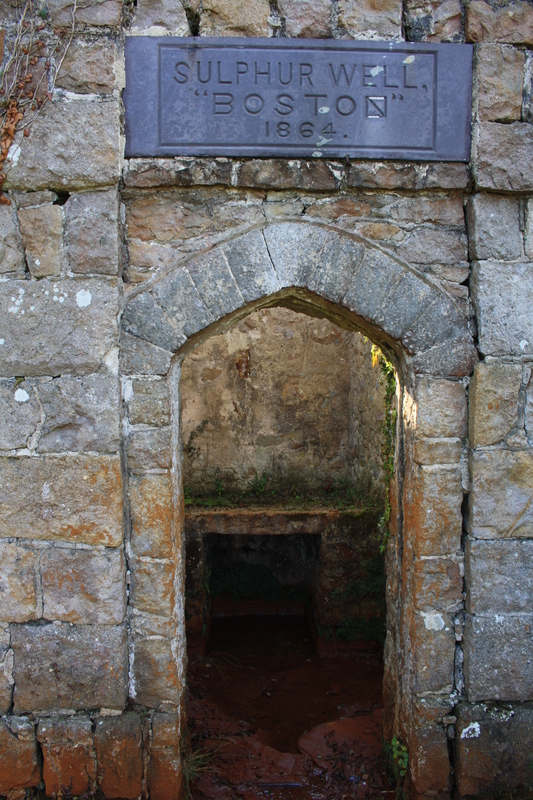 An article appearing in the newsletter of Cymdeithas Ffynhonnau Cymru ( the Welsh Wells Society) in 2004 suggests that the well had a local reputation for healing, and that it was known by locals as ‘copper water’. The article goes on to discuss an article by E Neil Baynes in the Proceedings of the Anglesey Antiquarian Society from 1928 which discusses the use of Ffynnon Parc Mawr as a cursing well. Intriguingly it describes a cursing ritual involving pins and frogs that was supposed to have been carried out at the well up until the early twentieth century. This in many ways it mirrors the practice carried out at the nearby Ffynnon Eilian on the coast a few miles to the north east raising questions as to whether there is some confusion in the informant’s mind regarding which well is being discussed, whether at some stage in the past stories had become confused or to some extent migrated between neighbouring wells; or even whether there was a more wide spread practice of cursing at wells whereby similar rituals were used and perhaps the well at which they were held was somewhat immaterial. I tend to go for one of the confusion options, and this may be down to the possible erroneous identification of this well as being Ffynnon Parc Mawr, but at what point in history it happened remains to be demonstrated. Certainly recent correspondence that I have had makes no mention of any memory of cursing at the well. It does however indicate that the well continued in use at least into the 1940s. Many local people would take water from the well for drinking during the late nineteenth and early twentieth centuries and ascribed their health to its use. I have a story of one gentleman who drank regularly from the well and believed it to be beneficial, living to the age of 90 and remaining fit enough to climb ladders and cut wood right up to the day he died. I am indebted to local resident Mair Williams for her interest in the spring and information she has provided for this article, and for passing on articles by herself and Eric Roberts which have appeared in Yr Arwydd, the local newspaper. Jones Gwilym T and Tomos Roberts (1996) Enwau Lleoedd Mon. The Place Names of Anglesey. Canolfan Ymchwil Cymru. The above is not true. Up to now I have never heard ‘Ffynnon Goch’ referred to as ‘Ffynnon Parc Mawr’. Could you please give me the reference of where this well is called ‘ FFynnon Parc Mawr? I do believe that in the distant past the land on the opposite side of Afon Lligwy was called Parc Mawr. With your permission I would like to copy your newest entry for this well and send it to Eric Roberts in order to see his reaction. i have found this name used in the book Ffynhonnau Cymru Vol 2 by Eirlys and Ken Lloyd Gruffydd. (Gwasg Carreg Gwalch, 1999). It is repeated in two editions of the newsletter of Cymdeithas Ffynhonnau Cymru by the same authors which can be found online at http://www.ffynhonnaucymru.org.uk/17_Nadolig_2004.htm and http://www.ffynhonnaucymru.org.uk/16_haf_2004.htm Please by all means send on the article, I would be very interested in any further feedback. It appears quite possible that the name has been incorrectly included in these publications so it would be important to ensure that it is corrected if necessary. Many thanks, Ian.